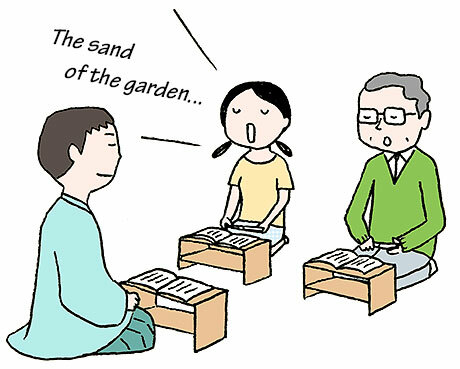 TRIVIA of Noh : Q142 : Which pieces are recommended for beginners? | Home | Trivia | Q142 : Which pieces are recommended for beginners? Which pieces are recommended for beginners? Amateurs typically learn Noh by practicing utai (chanting) and shimai (dance). The practice of utai is considered particularly important because the story of the play is expressed through chanting. Many people therefore practice only utai. If you learn to play the flute or tabor, you will also have to learn chanting, because the musicians play the instruments to accompany utai. Practice for chanting starts by learning memorable pieces one by one, to acquire the different ways of utai. “Tsurukame” is one of the pieces that beginners practice first. The play, set in a palace in ancient China, is a joyous piece in which a crane and a tortoise dance to wish for the longevity of the emperor. You can gain a basic grounding in Noh chanting with this very short piece. “Hagoromo” is another piece for beginners. At the climax of the play, the fisherman (waki) doubts whether the angel will show him a dance before going back to the heaven if he gives back a feather mantle (hagoromo). The celestial maiden (shite) then chants, “Suspicion exists only in the human world. Falsehood does not exist in the celestial world.” The chanting of the fisherman and maiden’s parts in different ways is a challenge of expression.